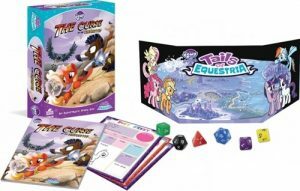 My little pony roleplaying game. the game everyone needs to try. If you play roleplaying games. You need to try to play this. Have fun while doing it. What is My little pony RPG. 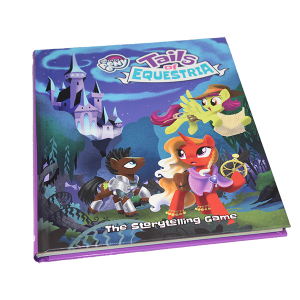 My Little pony Roleplaying game is a roleplaying game Made By River Horse*. And is a very simple Roleplaying game for the experienced roleplayer, who have tried a lot of roleplaying systems, this system is obvious made to be easy for children to play. So they can be apony in the world of Friendship, meeting Fluttershy, Applejack and the others from ponyville. You take the role of your own pony. You decide what he/she looks like. You Design your very own cutiemark. And then find out what your cutiemark talent is. This is an open system which allows you to somewhat makeup your special skills, so you are able to live up to the fanasties from whomever you are playing this game with. The mechanics in this game is very very simple. You use the same dice as in dungeons and dragons, and the system has been very simplified. When they made this. Each stat starts with D4 and then evolves upwards so next would be D6 then D8 and so forth, this is made to be easy to understand. All the skills run with the same way of levelling up. So when you get better your dice is simply getting better. And just to simplify things some more, you actually dont need Dice as they have made Dice Pages in the Core rulebook, close your eyes and point at the page, and it will show what you have “rolled”. The stats in the Game are also simple you have Mind, Charm and Body. as your 3 primary stats. You then have stamina which is your Life which is based upon Body + you main stat Mind or Charm. Exploding Hoof!! an exploding hoof is a game mechanic seen in various RPG’s this is if you Roll a 6 On a D6 you get an Exploding Hoof and you can then Roll a D8. if you roll and 8 here, you get to roll an D10 and so forth. This ends when you do not roll maximum on the dice or a D20 is rolled. The Friendship token mechanic is a fun way of shoving that friendship IS magic in this game, you can give a friendship token to another player if he/she has failed a roll. That they might needed to have made. They can then make a new roll with a better dice. Or this can be a bit of a game changer. Like i had these 10ft ropes in my saddlebags. If you hand over a token to your game master. There is actually no limits to what you can do, unless your gamemaster says its a no go. This was basically what you need to know about the mechanics in the game. Yes they are this simple. They are what you make them. Can you play it as an adult. Yes you Can play this game as an adult, no problem, If you are used to High fantasy, Dark fantasy High end roleplaying, hack and slash. You might have a little difficulty getting used to this though. As You would have to rethink the way you play a roleplaying game. we in my group had some very fun session, once we got the hang og My Little Pony Universe. And how things are done in Equestria. As you dont do combat you scruffle, and when you are defeated in a scruffle you dont die, you just start crying. Because the bad ponies og creatures did hurt you. This game can bring so much fun for people in all ages. as long as they let loose of themselves and enjoy the fun of this world. If you would like to learn a bit about what roleplaying is i can recommend my post about that subject, right here.